From that opening scene, in which a newborn in seemingly dire health is mysteriously abandoned in the Red Sox clubhouse, the well-plotted, plausible novel hurtles forward with the help of well-drawn characters and a deep and satisfying sense of setting. The Red Sox themselves show up periodically to contribute to both of these rich elements of the book. The appearances by the players, which if handled poorly would have doomed the book (at least for baseball fans), is handled by the authors with a pitch-perfect ear for how, for example, Jason Varitek would act when confronted with an ill infant in his clubhouse, or what Big Papi would do if a player in the Sox’ minor league system came to him for help in a very difficult situation. The book also features an innovative way of propelling the action forward by periodically inserting entries and accompanying reader comments from a fictional Red Sox fan’s blog. The blogger in the novel comments on the ongoing mystery that began in the Red Sox clubhouse and offers as-yet unrevealed details, which at times gives the blog entries an ominous feel as the reader can’t help but wonder how he knows so much about the case. Additionally, the reader comments serve brilliantly as a kind of Greek chorus lamenting and celebrating the downs and ups of the mystery (and the Red Sox’ season). At the core of the lived-in, baseball-saturated world of the novel is the police detective working to solve the case, which comes to involve not only the abandonment of a baby but kidnapping, murder, and international human trafficking. This detective, Rocky Patel, is an excellent character, unusual and compelling, and unshakably dogged in his pursuit of the truth below all the fascinating and grisly murk of the mystery. Because of his magnetic presence, I would have been drawn forward by the book even if it hadn’t so richly and authoritatively portrayed a world in which the Red Sox are as intrinsic to life as water or air. 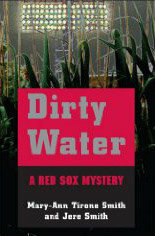 Lucky for me, and for all fans of baseball and of fiction with deep roots in the world it describes, Dirty Water gleams in the glow of the brilliant light stanchions of Fenway.